In conjunction with Folsom's Centennial Celebration, a map of the town as it appeared in the 1920's was produced with the help of Vera Jenkins. Click below to view the map. To view a larger version, CLICK HERE and then click again on the map that appears. 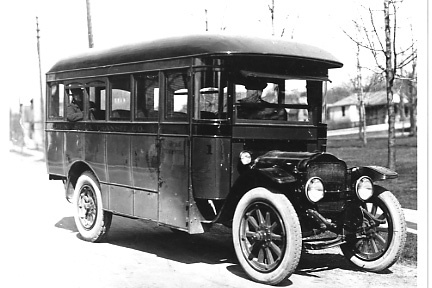 Here is the bus schedule for St. Tammany towns and vicinity for December, 1922. Click on the image to make it larger. 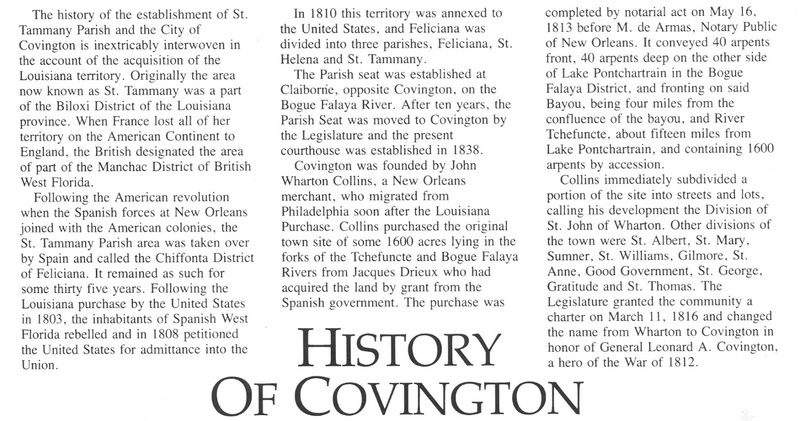 The history of the establishment of St. Tammany Parish and the City of Covington is inextricably interwoven in the account of the acquisition of the Louisiana territory. Originally the area now known as St. Tammany was a part of the Biloxi District of the Louisiana province. 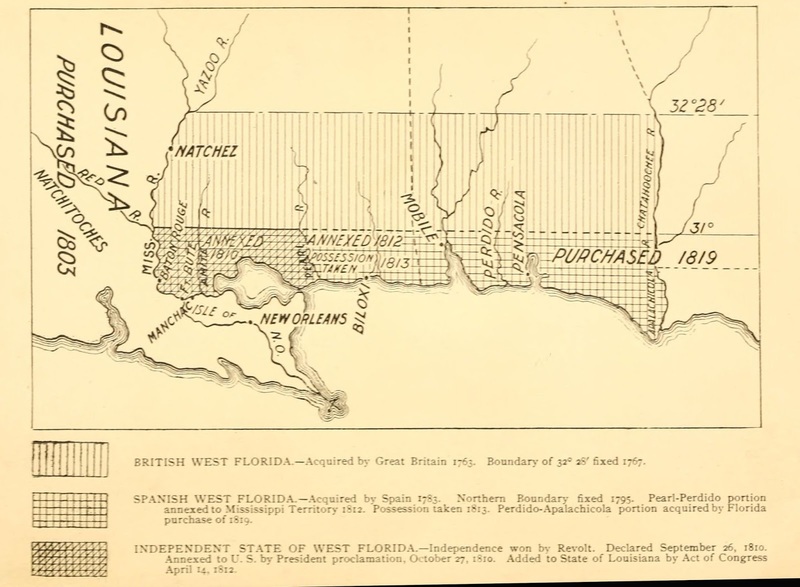 When France lost all of her territory on the American Continent to England, the British designated the area of part of the Manchac District of British West Florida. Following the American revolution when the Spanish forces at New Orleans joined with the American colonies, the St. Tammany Parish area was taken over by Spain and called the Chiffonta District of Feliciana. It remained as such for some thirty five years. 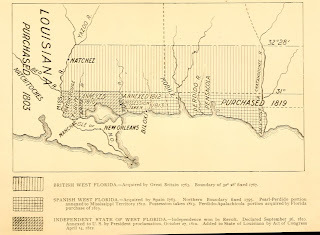 Following the Louisiana purchase by the United States in 1803, the inhabitants of Spanish West Florida rebelled and in 1808 petitioned the United States for admittance into the Union. In 1810 this territory was annexed to the United States, and Feliciana was divided into three parishes, Feliciana, St. Helena and St. Tammany. The Parish seat was established at Claiborne, opposite Covington, on the Bogue Falaya River. 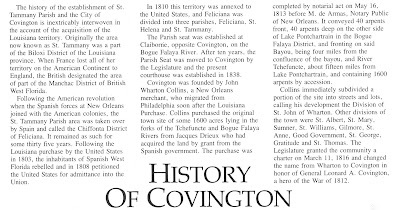 After ten years, the Parish Seat was moved to Covington by the Legislature and the present courthouse was established in 1838. 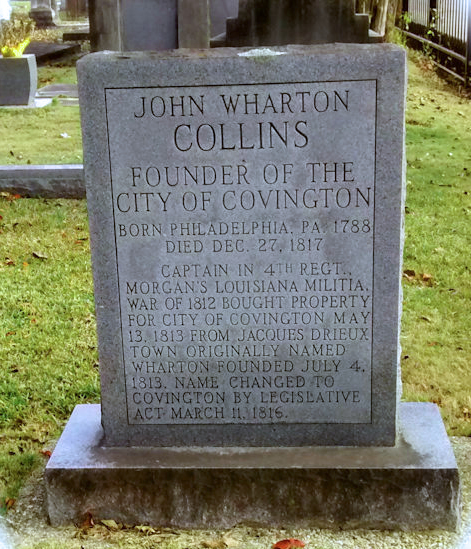 Covington was founded by John Wharton Collins, a New Orleans merchant, who migrated from Philadelphia soon after the Louisiana Purchase. Collins purchased the original town site of some 1600 acres lyinc in the forks of the Tchefuncte and Bogue Falaya Rivers from Jacques Drieux who had acquired the land by grant from the Spanish government. The purchase was completed by notarial act on May 16. 1813 before M. dc Armas, Notary Public of New Orleans. It conveyed 40 arpents front, 40 arpents deep on the other side of Lake Pontchartrain in the Bogue Falaya District, and fronting on said Bayou, being four miles from the confluence of the bayou, and River Tchefuncte, about fifteen miles from Lake Pontchartrain, and containing 1600 arpents by accession. Collins immediately subdivided a portion of the site into streets and lots, calling his development the Division of St. John of Wharton. Other divisions of the town were St. Albert, St. Mary, Sumner, St. Williams, Gilmore, St. Anne, Good Government, St. George, Gratitude and St. Thomas. The Legislature granted the community a charter on March 11, 1816 and changed the name from Wharton to Covington in honor of General Leonard A. Covington, a hero of the War of 1812. In 2015 the La. Dept. 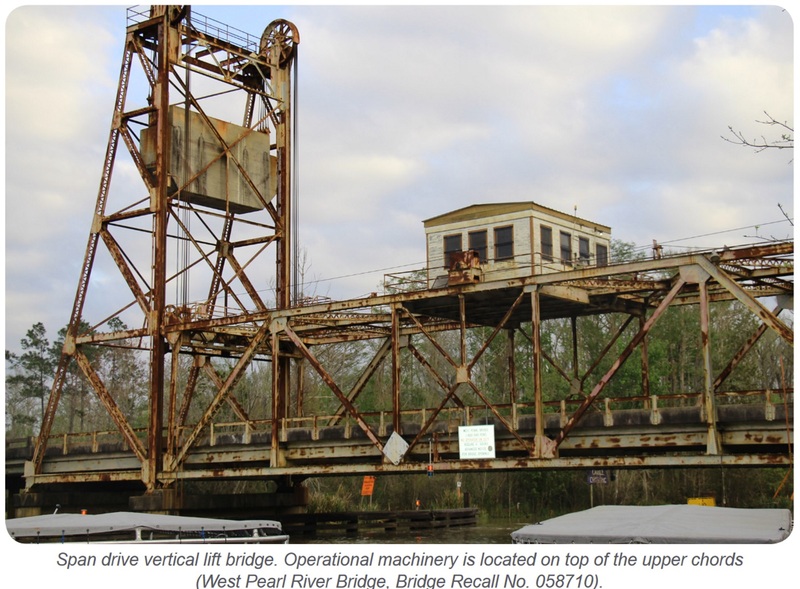 of Transportation and Development published a 224-page report on the "historic bridges" of Louisiana. Eleven of those named were located in St. Tammany Parish. The report was entitled "Crossing the Bayou: Louisiana's Historic Bridges." Here are some text excerpts and photographs from that report. The full document can be read as a PDF File by CLICKING HERE. The "historic" bridges of St. Tammany parish are listed beginning on page 175 of the document. 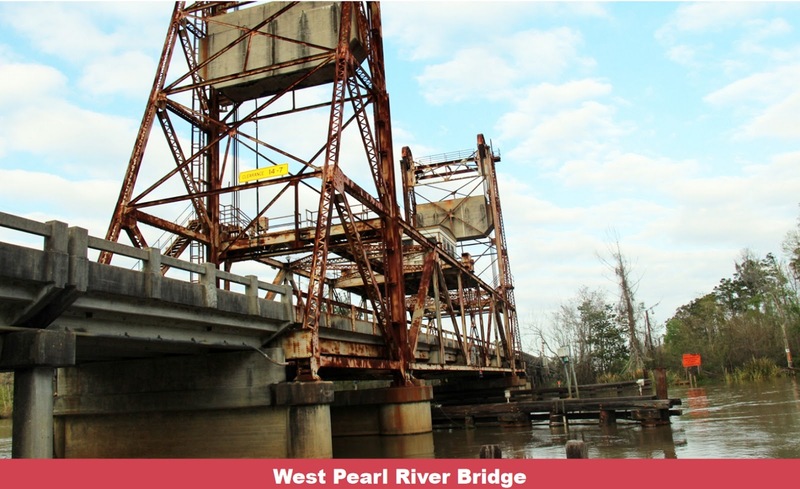 "Louisiana’s historic bridges are an important part of the state’s transportation and cultural history. With approximately 40 percent of all wetlands in the United States and nearly 4,000 miles of navigable waterways, Louisiana’s engineering history, maritime heritage, and important industries like fishing and oil refining are linked historically to the bridges that cross our rivers, bayous, channels, and canals to facilitate transportation. 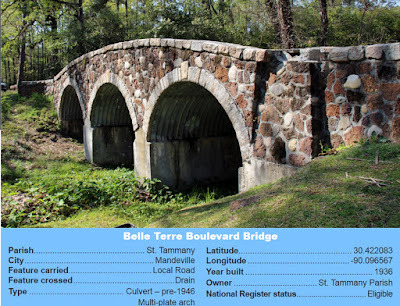 St. Tammany has eleven bridges of historic preservation interest, according to the state highway department's "Crossing the Bayou: Louisiana's Historic Bridges" report. Louisiana has more wetlands than any other state. It contains 11,000 square miles of flood-plain; 7,800 miles of coastal swamps, marshes, and estuarine waters; countless streams, lakes, canals, spillways, and artificial waterways; and is traversed by five major navigable rivers. 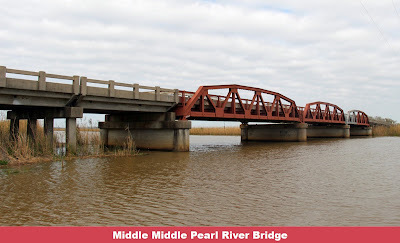 Bridges are important connections in Louisiana’s transportation history and engineering heritage, spanning the state’s many bodies of water. 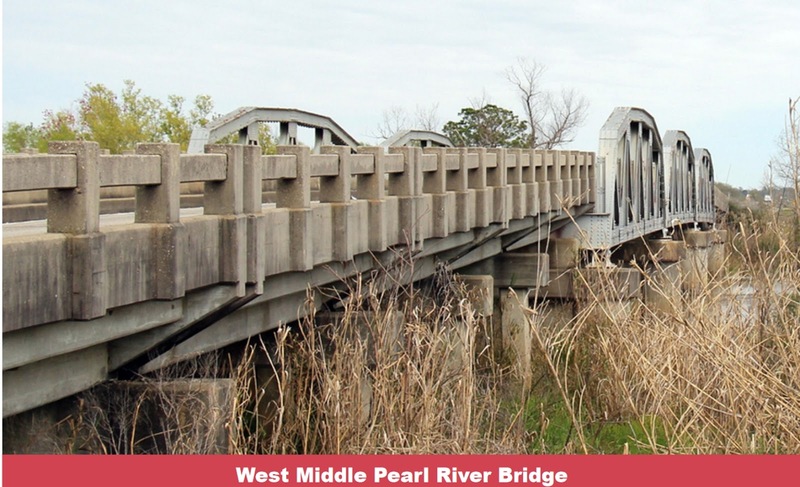 Historically, the development of bridges in Louisiana was highly influenced by two important factors that remain relevant to this day. First, the state’s topography and environment created difficult conditions for bridge designers and builders. The state’s abundant waterways and unstable soil, particularly in southern areas, posed great challenges to bridge construction. Second, the state’s bridge history is closely tied to the development of road networks throughout the twentieth century. 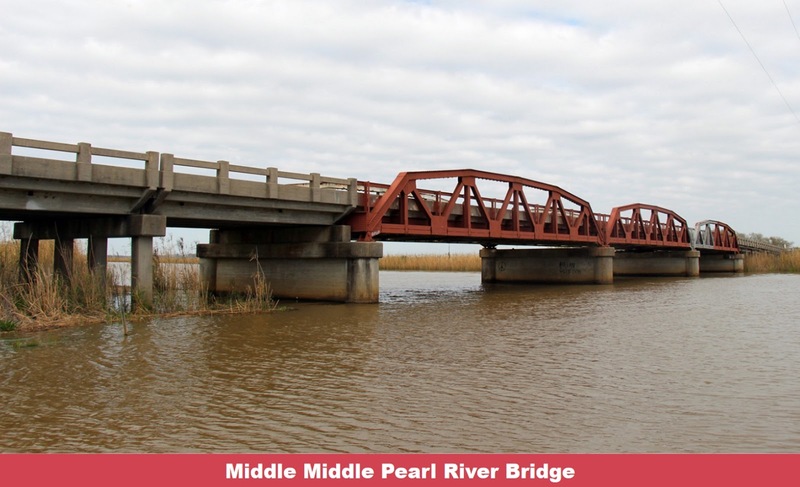 Creating and facilitating a reliable transportation system led to the construction of several uncommon bridge types and variations customized for certain site conditions unique to Louisiana. Few bridges were built in Louisiana prior to the twentieth century. Steamboats and ferries utilized the state’s network of waterways to provide transportation. Interest in improved roads began in the late nineteenth century and rapidly accelerated with the introduction of the automobile around the turn of the twentieth century. Known as the Good Roads Movement, this interest was driven by public demand for better road conditions and a more efficient road network." 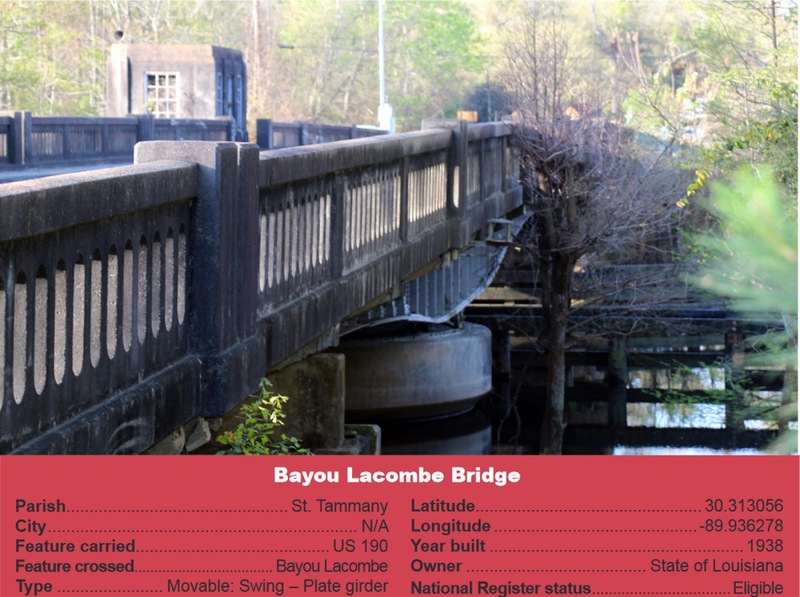 Here are a few photos of St. Tammany bridges from the report. 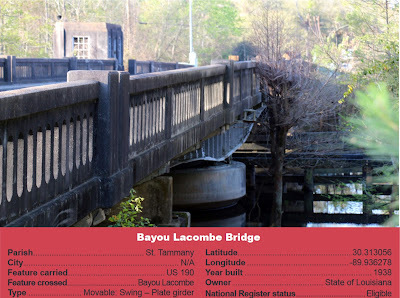 The total number of bridges in St. Tammany Parish is 355, according to TRIP, a national transportation research group. Twelve miles north of Covington is the Village of Folsom, surrounded by thoroughbred horse farms and plant nurseries, a crossroads of commerce, and home to two spirited schools. Though a relatively new St. Tammany town, its history is unique. It began as an end-of-the-line railroad town, where timber and lumber were the chief resource and product. As it grew, bricks and tung oil were added to its exports. I visited the town library branch earlier this week, and they were very gracious in sharing their scrapbooks full of information about the community, the issue files of its two newspapers, the numerous clippings from Covington newspapers over the years, and most of all, its comprehensive body of documents gathered during the village's Centennial Celebration 15 years ago in 2004. 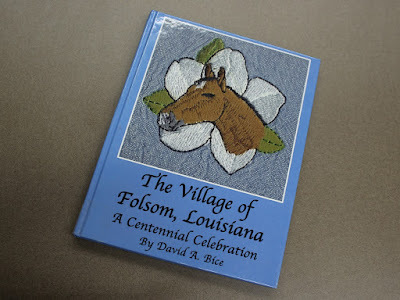 The library offered so much information, in fact, that I would suggest that anyone interested in the history of Folsom should just clear their schedule for a few hours and go there to peruse the scrapbooks, picture albums, and history reports. They have a copy of the special section put out by the St. Tammany Farmer back in 2004 to help mark the 100 years anniversary of the town, as well as collections of the ongoing weekly columns by local writers chronicling the hopes and dreams, trials and tribulations, and family connections of prominent citizens from all walks of life. Folsom has had its share of famous folks and local politicians, artists, librarians, and others. There was even a book written about the town to commemorate the Centennial, and a pictorial map of the village that I drew up to suggest what the town looked like 100 years before. 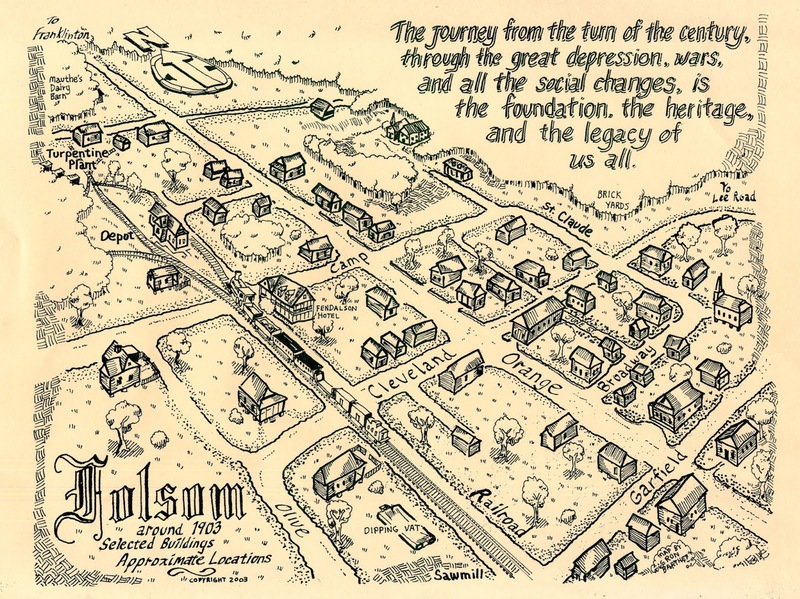 By 1880, the area that is now the Village of Folsom was occupied by several families. As recorded in the 1880 United State Census, adults in Folsom were listed either as farmers or a housewives. 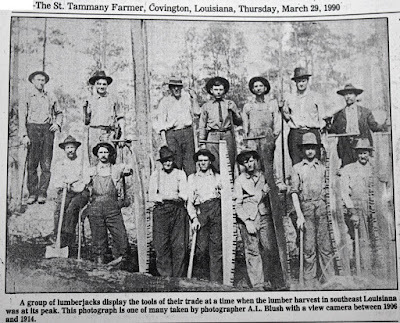 At the time St. Tammany continued to be mostly virgin forestland and land used for cultivating crops. The parish was traversed by trading routes, including Holmesville Road, which were dirt roads that were maintained by the St. Tammany Police Jury. Police Juries were the form of local governmental the time and semi-annual meetings were held in January and July. Often, the Jury would wait 3-4 days before a quorum was present to begin the meetings, and meetings would last up to six days. Land in the area was available for homesteading under the Recovery and Reclaims Acts of 1855 and 1857, averaging about $1.25 per acre. Between 1868 and 1886, over 3,200 new acres of land were homesteaded, in 1887 another 2,500 acres of land, and between 1888 and 1897, another 4,000 acres of land was homesteaded in the Folsom area. Amidst this growth in new landowners, Native American tribes still lived and traded. It was in 1904, when George M. Fendlason and his brother Hines Norman filed for a plat of survey, that Folsom became a village, which became known for its towering pines and its rolling hills. Folsom earned its name from President Grover Cleveland’s wife, Frances Folsom Cleveland, an icon for working women at the time. One of the first lots was sold in Folsom in November 1904. In 1881, work began on the Northshore’s railroad. 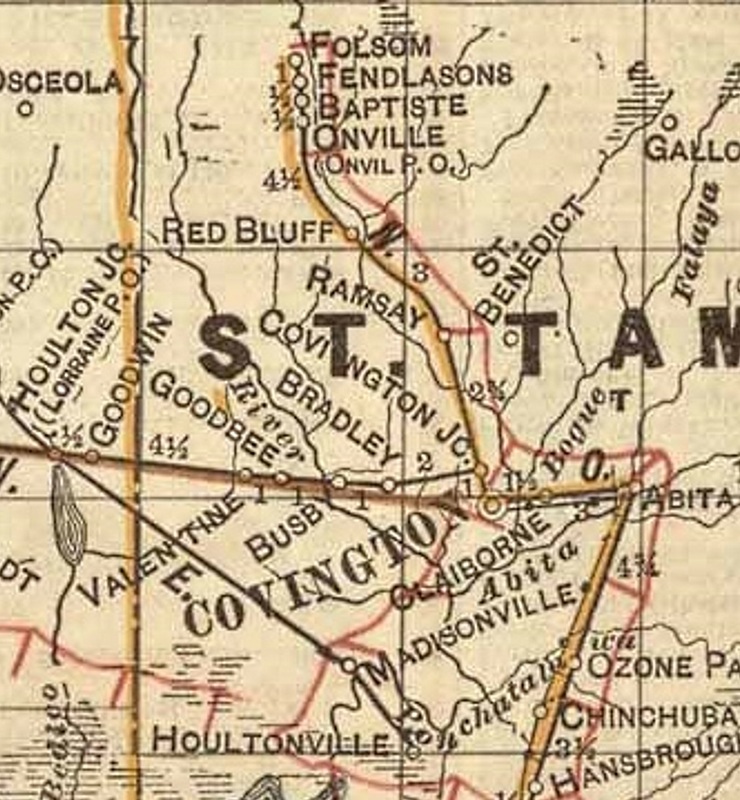 Completed in 1887, this railroad connected New Orleans to St. Tammany Parish, including Slidell, Lacombe, Mandeville, and Abita Springs. 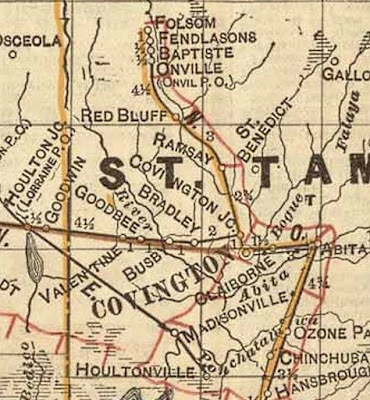 By 1888, Covington was connected and by 1905, the East Louisiana Railroad had laid tracks down and built a depot on what is now Railroad Avenue in Folsom. During this time, the principle crops of the area were cane, cotton, rice, and corn, but through the railroad and with the abundance of local pine, Folsom was also known as a logging community. In 1885, eggs cost 20 cents a dozen, coffee 20 cents a pound, cheese 10 cents a pound, and haircuts 20 cents. 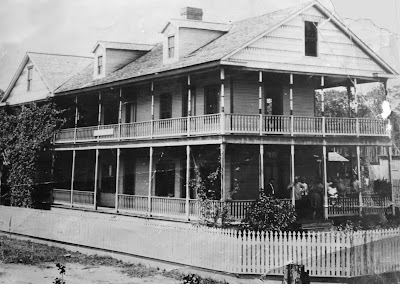 By 1908, as reported by the St. Tammany Farmer, the Village had grown to include several prosperous merchants, including a general merchandise store, drug store, a barbershop, a meat market, a brick company, a gin company, and what was said to be one of the best hotels in the area. 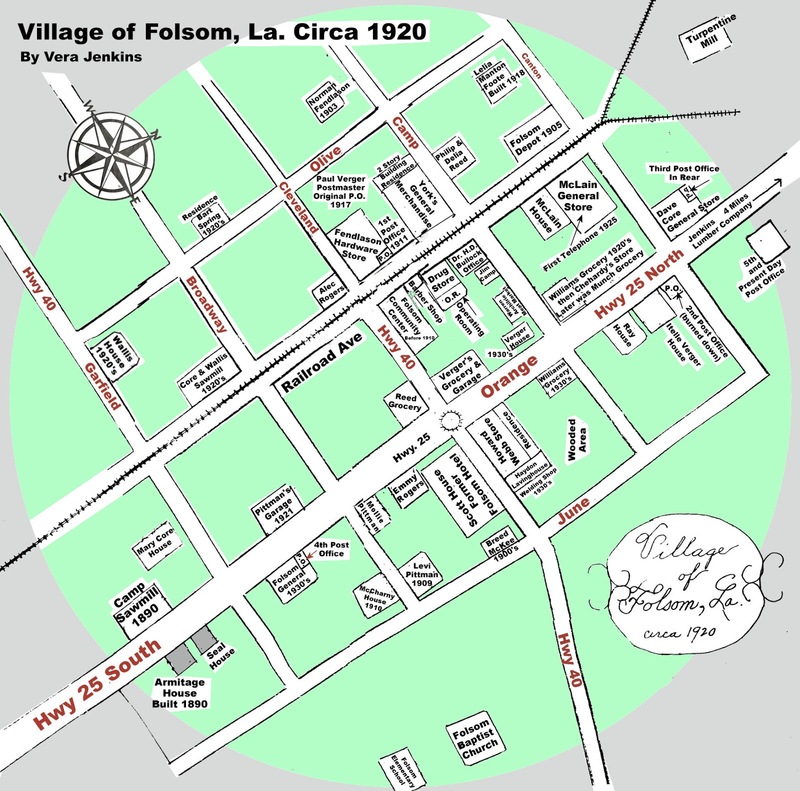 In 1915, the Village of Folsom was incorporated, however Folsom did not have enough revenue to operate as an incorporated village between 1928 and 1947. Folsom was re-incorporated in 1947, and it was then that Folsom’s municipal government was established with William P. Dyess becoming the first mayor and Hayden Lavinghouse the first policeman. The Louisiana State Tobacco Tax of 1947 provided the much needed tax revenue for the Village. By 1938, the New Orleans Great Northern Railroad, successor to the East Louisiana Railroad, had ceased operating the railway through Folsom. Although the right of way had been dedicated to public use in 1904, the rail company sold its land in the right of way. 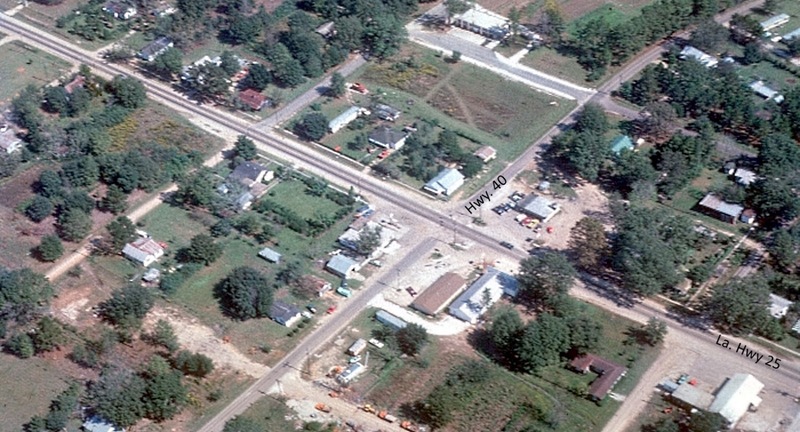 Between 1938 and 1967, Railroad Avenue was occupied by various single-family homes. It was not until 1964, when the Village filed a lawsuit to determine rightful ownership of this right of way that Railroad Avenue returned to the Village. It is now home to the police station and library. In 1950, St. Tammany Parish had a total population of 26,988. It was in the 1960's that St. Tammany Parish began to see moderate growth from NewOrleans residents moving to the Northshore. Until that time, the parish had been largely sheltered from rapid growth, allowing its municipalities the ability to maintain their ways of life and regional cultures well into the 20th century. Growth in the western and northern areas of the parish in the 1960s, including in Folsom, was less dominated by commuters from the Southshore. In the 1970s, growth on the Northshore really took hold. Despite this growth in the southern and eastern areas, Folsom has remained a quaint and small town. 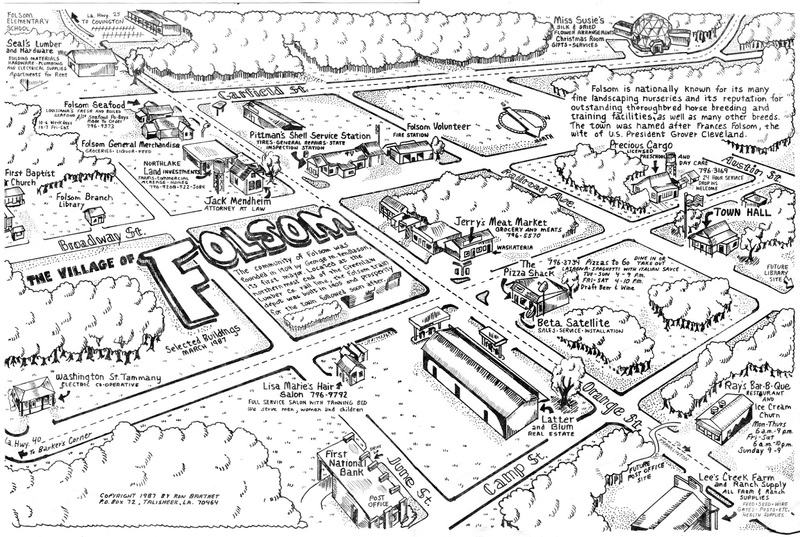 Folsom established its first Zoning Commission in the mid-1970s. The commission, whose purpose it was to protect property values, created a 300-foot commercial zone along both sides of Highways 25 and 40. Climate and soil have always been the backbone of Folsom’s economy and it is from these local virtues that the people of Folsom have found established their high quality of life and small town atmosphere. The land in Folsom was first farmed. 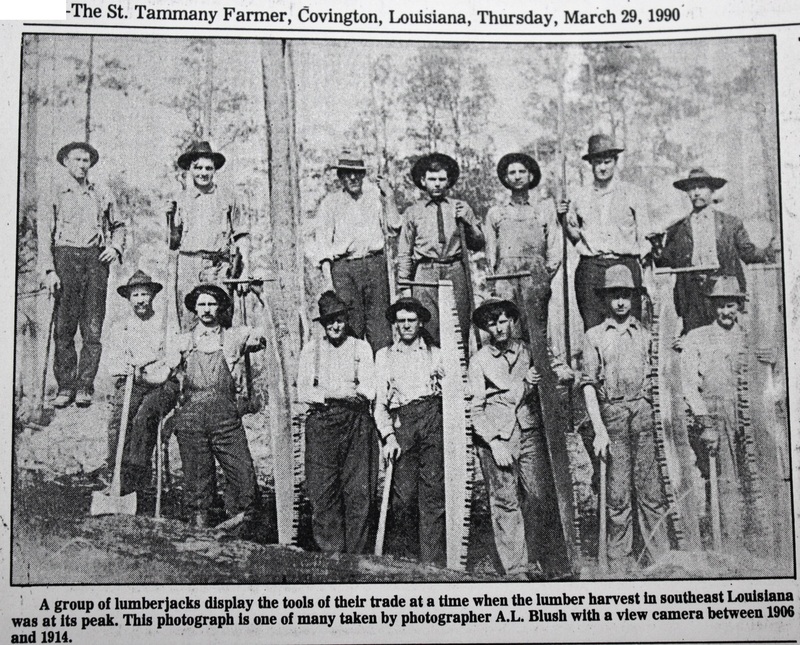 With the arrival of railroad, lumber, tar, and turpentine became the locally exported products. This was then replaced by tung nut farming and finally, the growth of the local plant nurseries. Horse farms compliment the nursery economy in Folsom and these two industries are what Folsom is known for today. The virgin forests surrounding Folsom originally initiated interest in the timber industry in the early 20th century. 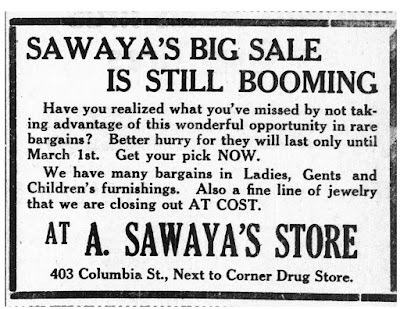 In 1902, the Greenlaw Lumber Company, Ltd. was established in Covington and operated as a mill, manufacturer, and distributer of lumber, with business connections to operating mercantile and shipping businesses. 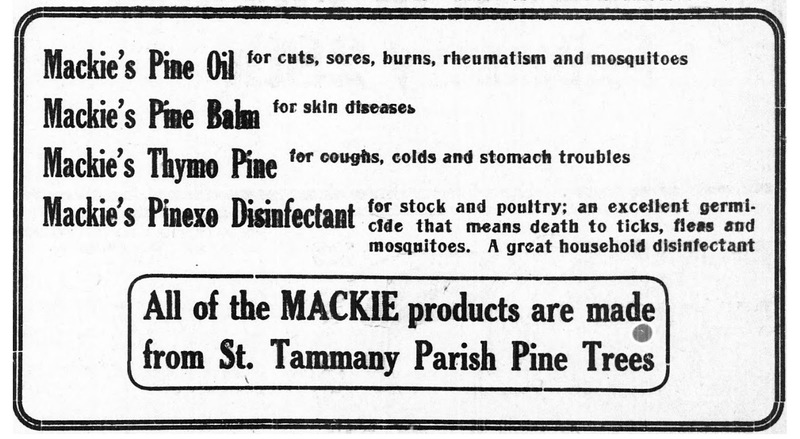 Other local lumber mills, turpentine, and tar companies included Jones and Picket, Ltd. (est. 1903), Frederick and Joseph Salmen’s lumber company, Holliday and Ray, Covington Naval Stores Company, the Frederick and Singletary Company, and Great Southern Lumber. In the early 1900s, many of the local residents were subsistence farmers, growing what they needed to clothe and feed themselves, including crops such as cotton, corn, cane, strawberries, grapes, and tomatoes. Local families helped each other in their fields picking cotton and strawberries and cane was processed into syrup. Turpentine, made from the sap of the pine trees that were so abundant in the area, also created the need for local turpentine mills to be developed, with this industry dying down in the 1930s. In the 1940s, the pine tree limbs left by lumber companies were gathered and used to make tar in the local tar kilns. Some sought work in other nearby towns and in the City of New Orleans. Domestic work and sewing jobs were often held by women to supplement the family income. Land cleared for lumber around Folsom provided grazing land for cattle and sheep. A short, but important industry in the history of Folsom was the tung oil industry, a key ingredient in lacquer, paints, and varnishes. This industry came to Folsom via the US government in anticipation of WWII, because the oil was used in the paints used on naval ships. In the local climate, the nuts thrived and tung oil became a short, but major business between 1945 and 1965. Tung farms in Folsom spurred the development of processing plants in nearby towns, including Bogalusa and Franklinton. Although relatively short lived, this industry was important enough for Folsom’s economy that it inspired a Tung Oil Festival and Beatrice “Sally” Core was the first Tung Oil Queen. Winter freezes from 1955 to 1959, lower cost imports from Argentina, and the development of acrylics delivered a blow to this economy in Folsom. 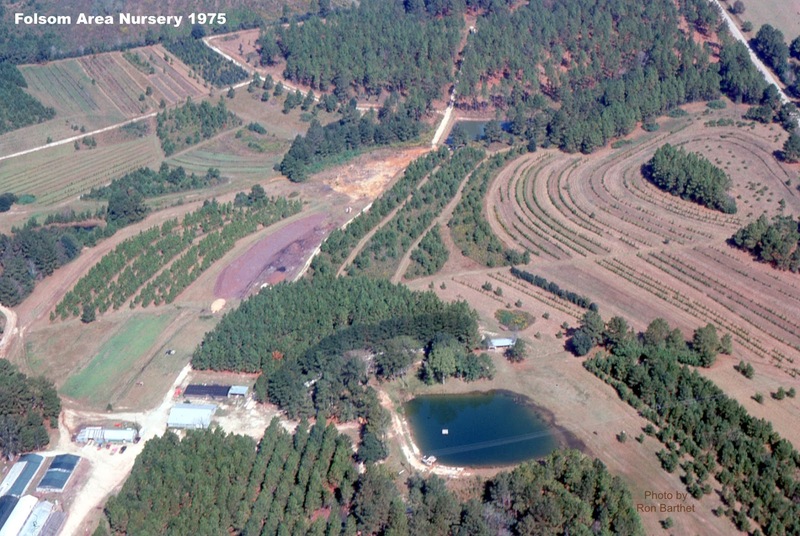 One of the largest tung oil land holders, Louis Chenel of Normandy Farms, converted his 1,000 acres to housing development, foreshadowing the influx of retirees to the area. Throughout this varied economic history tied to the land, there have always been nursery businesses in Folsom. Magee’s Folsom Nursery, Evergreen Nursery, Midway Nursery, Mizell Nursery, and Holly Point Nursery, all owned by brothers Dallas and Price Magee and various family members, were the first nurseries in Folsom. The heritage of nurseries has been passed down since. Jim’s Nursery, Hillside Nursery, Yates Nursery, Brumfield Nursery, Burris Nursery, McKee’s Nursery, and Green Thumb Nursery are just some of the nurseries that have contributed to the heritage. Local resident and owner of Savannah Spring Nursery in the 1980s, Robert “Buddy” Lee developed the “Encore Azalea” which is sold worldwide. Folsom’s nurseries have had an impact nationwide. Floyd Magee, the son of Dallas Magee, first sold nursery products by mail order and provided Montgomery Ward with all of its catalogue sales. The “Weeping Yupon” tree was also developed in Folsom. Local nursery owners Jack and Doris Yates Magee sold plants to Sears for resale and to Phillips Petroleum for landscaping around gas stations. 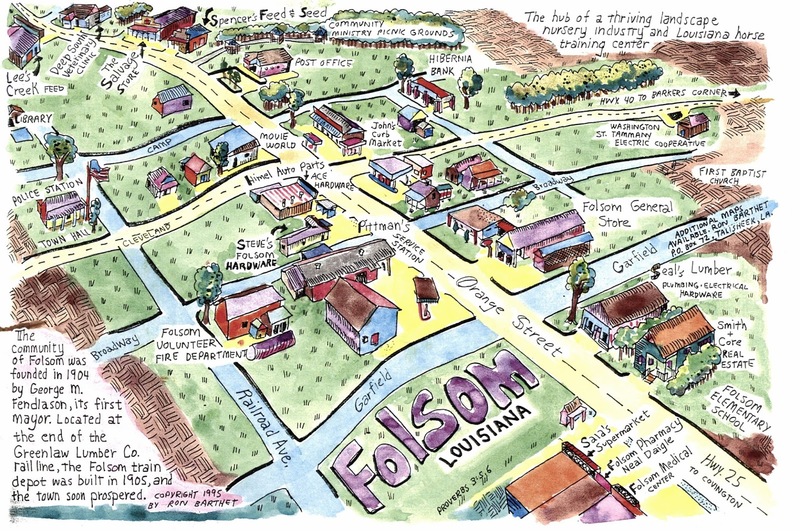 Folsom continues to be the center of the nursery businesses in Louisiana. In October 2003, Folsom hosted the South East Louisiana Nursery Association meetings for the second time. In addition, thoroughbred racehorses and equestrian activities play another critical role in Folsom’s economy. According to local resident Jimmy Erwin, good local drainage, north of Bennett Bridge Road, provides solid footing for training horses. 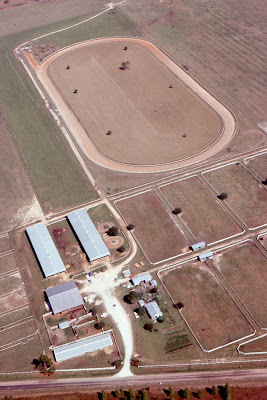 It was Jimmy Erwin’s father Andrew “Red” Erwin, the first president of the Louisiana Thoroughbred Association, who was instrumental in bringing the horse business to Folsom by developing the first horse farm on land defunct from the tung oil industry. In 1958, he opened Broken R Ranch. Erwin, with State Senator B.B. “Sixty” Rayburn was influential in getting the Louisiana Legislature to create incentives through the Louisiana agricultural program for breeding thoroughbreds in Louisiana. 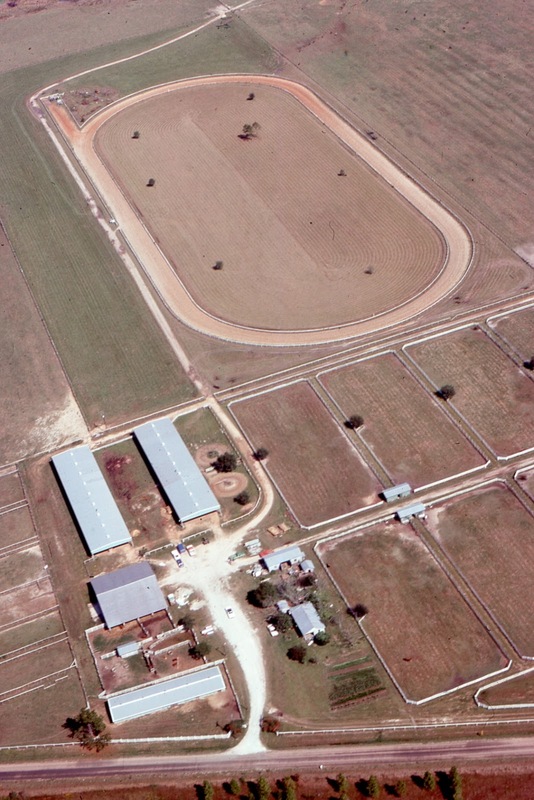 Races at the New Orleans Fairgrounds and at Louisiana Downs in Lafayette have supplemental purses for Louisiana bred horses and each racetrack must have three Louisiana bred horse races each day. Local horse farms have contributed greatly to Folsom’s economy, employing local residents and becoming known for their fine training. A stable fire in 1966 caused the Broken R. Ranch to rebuild and upgrade their stables to ones with open sides to allow breezes in to lessen the summer heat. Other ideas brought to Folsom and cultivated as part of the local horse culture included rehabilitation pools and horse training centers where horses could be housed over longer periods of time and thus be able to get used to other horses and the track on which they trained. Clear Creek also serves as a rehabilitation center for injured thoroughbreds, with numerous full and part time employees taking care of injured horses. 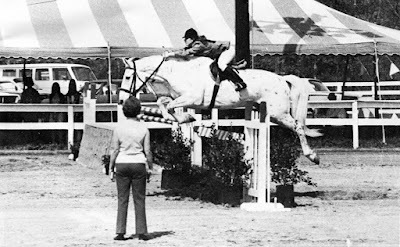 As with the nurseries influence and exportation across the United States, Folsom’s horse industry play an important role nationwide in thoroughbred culture. In addition to the thoroughbred culture, Folsom is known for its equestrian industry, with show horses and jumpers raised locally. Click here for information about horse farms in St. Tammany Parish. The New Orleans Polo Club is active in the area. Click here for a link to its website. Folsom today is dotted with small businesses along Hwy 25. J.C. Pittman’s store and gas station is no longer there, but Gus’ Restaurant and a New Orleans style bakery have become local staples. 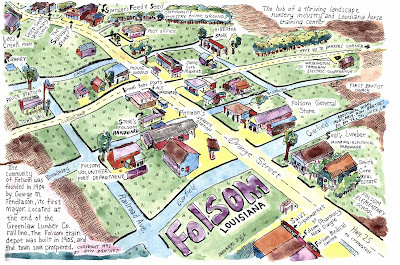 Most residents in Folsom have long family roots here. 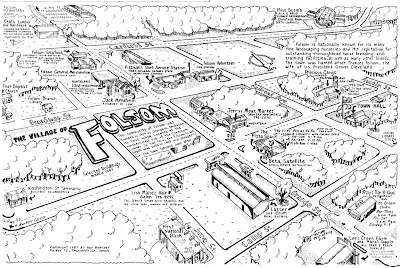 Today, continuing in its tradition of valuing open space and a connection to the land, Folsom is known for its thriving plant nurseries and beautiful horse farms. The countryside outside of Folsom is home to exotic animal farms, including emu and ostrich, and reserves, including the Global Wildlife Center in Tangipahoa Parish, which sits on land once used by the lumber industry. The Global Wildlife Center is a major educational facility and critical in the preservation of various species. This was the end of the Comprehensive Plan: Vision 2030 history narrative. In an April, 1986, history class report entitled "The Founding Fathers of Folsom," Pat Carr wrote that while the Folsom area is "not very densely populated, but is presently showing a great increase." She attributed that growth in population to an increase of influence by New Orleans landowners. At that time, the village had a new "supermarket" and even a few subdivisions. "Hopefully, this will not destroy the friendly country atmosphere that Folsom has always had," she said. 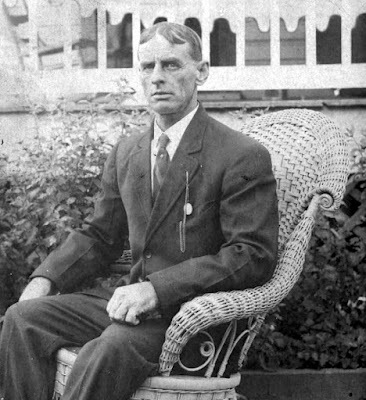 Norman Feldlason was one of the homesteaders of the area around Folsom. His family was one of many that came to the Florida Parishes in the 19th century from the Carolinas and Georgia. His parents, John Fendlason and Katie McLain, were married in South Carolina in 1830. Five years later, in 1835, they moved west with their children, Daniel, Margaret and John Jr., and with Katie expecting her fourth child, Flora. On October 15th, 1841, she bore twins, Elizabeth and Norman. In the winter of 1845-46 the Fendlasons moved to Taylor Creek, a tributary of the Tchefuncte River and in present day Tangipahoa Parish above Louisiana Highway 16. The family farmed here that year and in 1847 John got a job working at Harper's Saw Mill. In 1881 Faye Carr, Norman's great granddaughter, found the old Fendlason cemetery where John and Katie are buried. Located deep in the woods along Taylor Creek, it is small and has only a couple of graves. Norman married Mary Core on November 15, 1860. She was from the Covington area, and they built a house in Alma a few miles west of what is today Folsom. He was very active in the community. He served in the War of the Confederacy, was a member of the Police Jury, as well as a member of the Parish School Board. From 1894 to 1898 he was Superintendent of Education for St. Tammany Parish. Norman and Mary had four children. The last two were Hines Norman, born November 12, 1872, and George Martin, born September 1, 1875. George married Nettie Rogers on January 17, 1895, and Hines married Neva Rogers, Nettie's sister, on March 6, 1898. These two brothers were very influencial in the area. George and Hines did a lot of buying and selling of land and timber rights. They were also involved in many other business ventures, including being partners in a turpentine business in the late 1800's. The Naval stores industry was an important part of the economy of St. Tammany Parish as far back as the 1730's. The abundance of pine trees provided sap needed to make tar, pitch and resin. These products were used on the hulls of wooden ships to keep them from leaking. In 1901 the Fendlason brothers sold all of their interests in their turpentine business to a larger company, Holiday and Ray. The Fendlasons had realized that the Greenlaw Lumber Company was planning a railroad and had bought land where the tracks would terminate. They sold a right-of-way for the railroad to Greenlaw in 1902. Norman Fendlason in 1902 built a heart of pine home near this right-of-way. It still stands today and is owned by Mr. and Mrs. Cyril Wilde, who planned to completely restore the home. Seeing that the railroad could unify the community, the Fendlason brothers had an area surveyed for streets and lots and on June 8, 1904, they dedicated the new town of Folsom at the Covington courthouse. Grover Cleveland was President of the Untied States at that time, and George Fendlason admired him greatly. 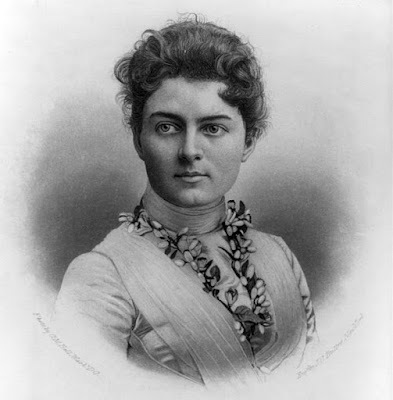 Cleveland had married Francis Folsom, at 21 the youngest first lady in the White House. George is said to have named the town after her. George sold lots in the town and the population grew very rapidly. Paul Verger had established a Post Office in 1892 at the 11 mile house. 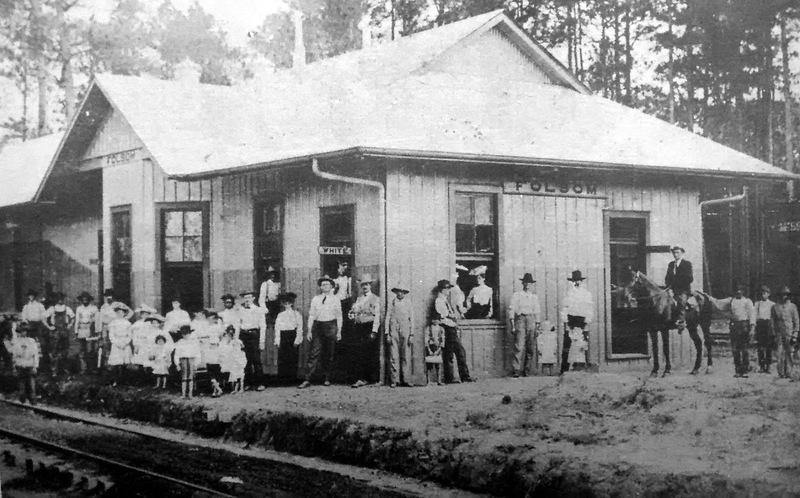 When the railroad came through it was combined with the Alma Post Office. Mr. Verger went in a partnership with the Fendlason brothers. George ran the general store and Paul ran the Post Office out of the same building. Fendlason and Verger became the largest mercantile business in Folsom, selling dry goods, groceries, hardware, all kinds of furniture, saddlery, farming and hunting supplies and many other necessities. There were several other businesses including a drug store, a barber shop and other retail stores. George built a hotel and livery stable and was mayor of the town for a long time. With access to the railroad the new lumber companies opened up. Folsom Export Lumber Company, Inc. specialized in exporting high quality lumber to the German and British markets overseas. Other new industries were the brick and cotton market of New Orleans. The Fendlason and Son Brick Company and the Folsom Gin Company were shipping out bricks and cotton to New Orleans in 1908. This was a form of reciprocal trade comparable to other big cities and rural areas. 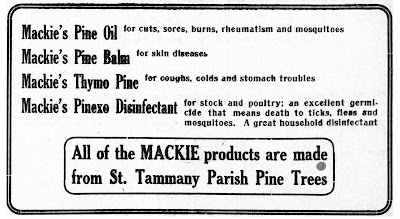 St. Tammany supplied food and raw materials, and New Orleans industries built furniture and fashioned clothing, some of which was shipped back to the north shore. The deep pine forests were finally cleared to a point where the lumber companies began to fail, and the spur to Folsom was eventually abandoned and the tracks taken up. Tung nut trees we grown on the cleared areas for the oil but did not last after the petroleum industry got going. Today Folsom is the center of a growing plant nursery industry. The Fendlason family believed in hard work and totally abstaining from all intoxicants. There are no Fendlasons left in Folsom but old folks in the town still remember them. Norman Fendlason died October 8, 1937, at the age of 95 years, outliving his wife and all of his children. George had gone to work for the state Highway Commission in Amite and died September 27, 1934. Hines died January 19, 1930. 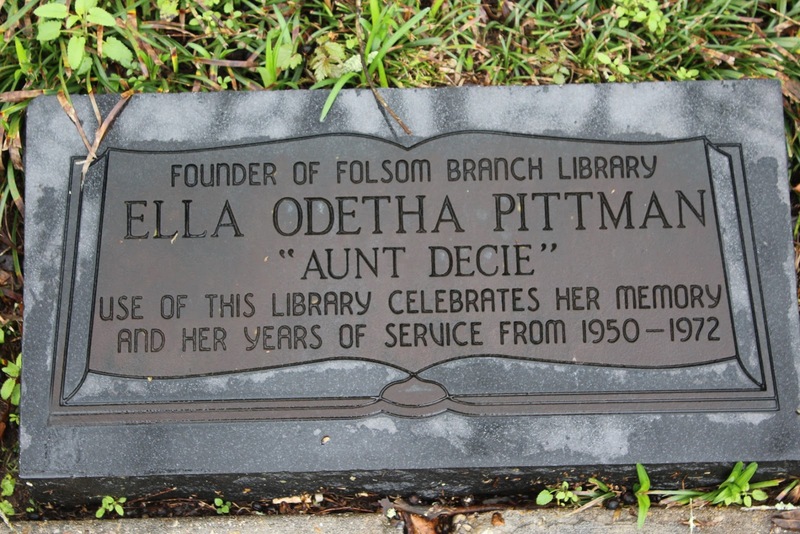 They are buried in the Fendlason Cemetery at Alma, a few miles west of Folsom. 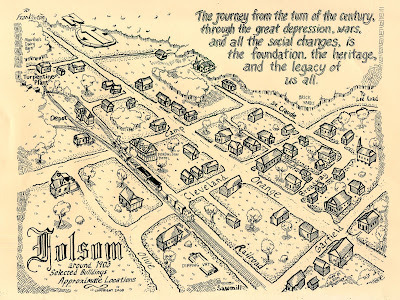 All of the other descendants no matter where they are, hold a special place in their heart for Folsom. I know because I am one of them. Hines Norman Fendlason was my mother's grandfather. And thus ended Pat Carr's 1986 history report on the Founding Fathers of Folsom. 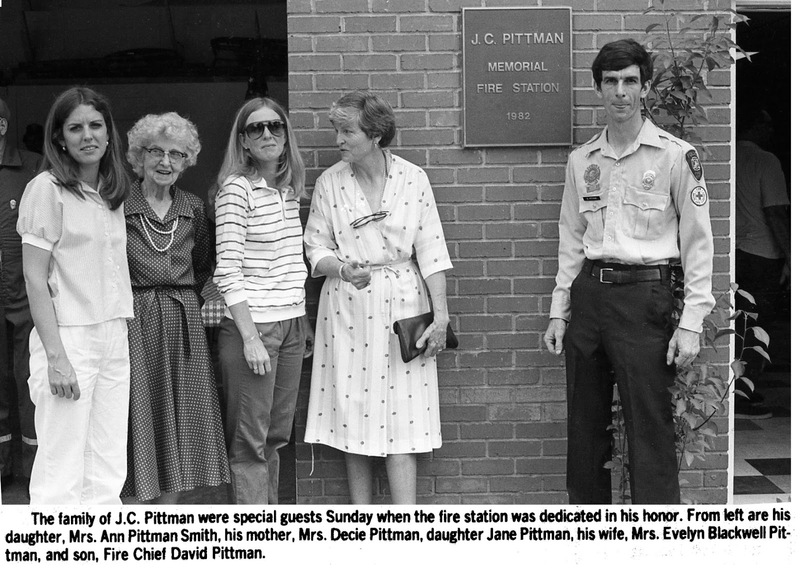 Thirty-seven years ago, in 1982, the J. C. Pittman Memorial Fire Station was dedicated in Folsom. A newspaper article covering the event and giving detailed biographical information about J. C. Pittman featured the following photo and text. Click on the images to make them larger and more readable. 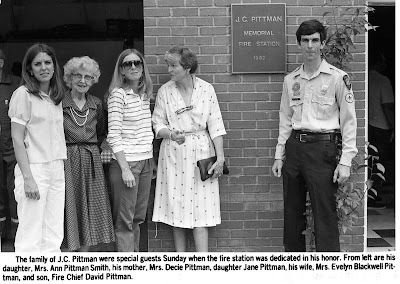 FOLSOM — The Village of Folsom paid homage to one of its favorite sons Sunday afternoon when the Folsom Volunteer Fire Department's fire station was dedicated to the memory of J.C. Pittman. 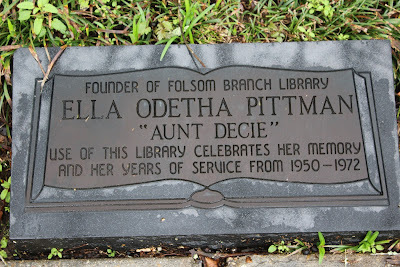 Pittman, who passed away last year, was one of Folsom's leading citizens. He was also one of the men who helped build the Folsom Volunteer Fire Department, and actually had a hand in building the first fire truck owned by the department. About 100 villagers turned out Sunday afternoon to honor the late fire chief, to inspect the three fire engines that make up the present department's firefighting machinery, and to reminisce about the man keynote speaker Brady Fitzsimmons characterized as "a soldier, a scholar, a family man, and a statesman." The brief ceremony was introduced by David Pittman, son of the late chief and present Folsom Fire Chief. Pittman, obviously moved by the events of the day, said, "We are here to talk about a man who was the chief, who was my Dad, and who I loved very much." Rev. Bill Bryant of the Folsom Baptist Church gave the invocation and benediction for the ceremony, and Jamie Pittman led the crowd in the Pledge of Allegiance. Fitzsimmons noted that although many government buildings have plaques on the walls naming them after someone, the Folsom fire station is different because it represents "the opportunity of the village to give something back to someone who gave it so much." Most of the people of Folsom knew Pittman well, Fitzsimmons said, adding that, "if you came late to this community, you missed something special." The designation "soldier, scholar, family man, and statesman" was appropriate for Pittman, and not just flattery, said Fitzsimmons. As an American soldier in the Second World War, Pittman was captured by Germans in North Africa and spent some time in a prisoner of war camp. Pittman was a searcher and adventurer, said Fitzsimmons, an honors graduate of Southeastern Louisiana University whose thirst for knowledge was never quenched. His fascination with and love for people is evident from the collection of photographs he left displayed in Pittman's Service Station. Because of Pittman's deep involvement with the Folsom Volunteer Fire Department, said Fitzsimmons, the dedication of the station "is a living memory and not just a plaque." He noted that when the fire department bought its first truck, a 1947 Ford, in the 1960's, Pittman was one of the men who labored to adapt the machine for fighting fires. "This building stands as a reminder that in giving we receive," said Fitzsimmons, "in pardoning we are pardoned, in death we are born." "When we come by this," he concluded, "we should seek to be as generous as J.C. was generous." A proclamation dedicating the fire station to Pittman was read by Folsom Volunteer Fire Department President Robert Boh. Special guests recognized at the ceremony included Folsom Mayor Mary Ellen Armitage, Police Chief Ronnie Holliday, Bush Fire Department Chief Ed Duhe, Bush Fire Department representative Edward Salathe, L.S.U. Fireman's Training School representative Thomas Hebert, Lee Road Fire Department Chief Austin Dawsey, and Lee Road Fire Department representative Harold Dutsch. Also in attendance were St. Tammany Parish Civil Defense Director Ansel Kern, La. Fire Marshal's representative Will Dane, LSU Firemen's Training Instructor Pete Rotando, Madisonville Fire Department representatives Rusty Wild and Allen Bouey, La. Fire Marshal's Office Investigator Merlin Flair, Veteran's Administration representative Guy Lund, and Fire District No. 4 Superintendent Emory Esquinance. Also at the ceremony were Pittman's mother, Mrs. Decie Pittman, his wife, Mrs. Evelyn Blackwell Pittman, and his children, David, Mrs. Ann Pittman Smith, and Miss Jane Pittman. What was going on 100 years ago this week? 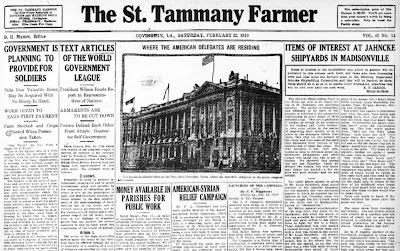 CLICK HERE for a link to the St. Tammany Farmer of February 22, 1919. The link is provided by the Library of Congress and its Chronicling America service. A long time resident of Covington, Wilfred Glockner was born in the Mandeville area on February 6, 1914. He began his successful career as an entrepreneur in the business world immediately upon his high school graduation. He first worked in the Taxi and Drayage business with his parents, Ruth and Henry Glockner. Shortly after marrying Elrita Gomez on June 16, 1937, what Mr. Glockner describes as the "happiest day of my life," he purchased a Service and Automotive repair business and then acquired the dealership for Packard automobiles and Reo trucks. In addition, the Glockners began buying rental property and later buying and selling residences. Mr. Glockner personally financed residential sales for clients unable to get financing. When Packard ceased building automobiles, Mr. Glockner started Wilfred Glockner Construction Company where he designed and built custom homes and commercial buildings. "I have been very successful with all of my business career," he said, appreciating the opportunities presented in the growing Covington area. "I've always been a great supporter of civic activities in my community," he went on to say. Mr. Glockner's civic contributions are many and varied. He served as a 47-year member of the Board of Directors of Citizens Bank and Trust Company and was a Commissioner on Water Board No. 3 serving Riverwood and Covington Country Club subdivisions for 20 years. In addition, he was a member of the Knights of Columbus for 45 years and the Covington Rotary Club for 47 years. "I will always be grateful for the good education that I received at Lyon High School," he said. "It was the best Public School in the Great USA, which put me on the right path to enter the business world." A good education and setting goals was his recipe for success. "My philosophy for a great life, be optimistic and set your goals high," he stated. Wilfred John Glockner passed away on July 7, 2009, at the age of 95 years. 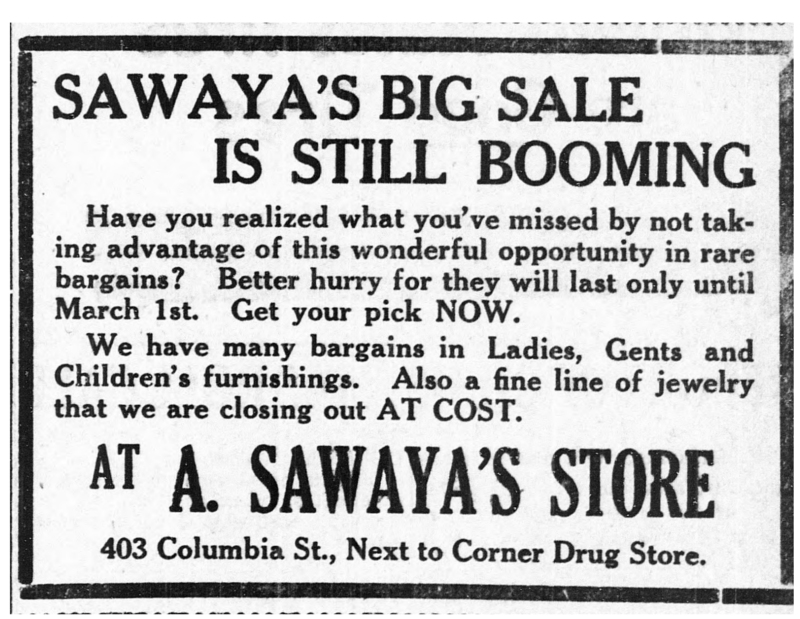 Here is information about two Abita Springs businesses in 1919, as published in the St. Tammany Farmer special business edition of January 11. 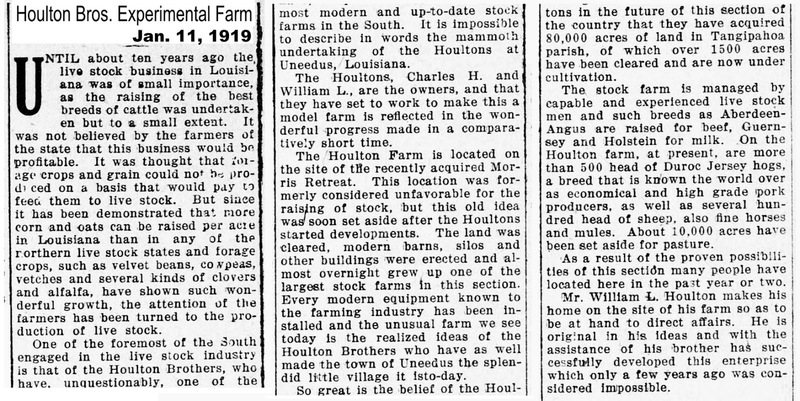 In 1919 an article appeared in the Farmer telling about the Houlton Brothers Experimental Farm in Uneedus. 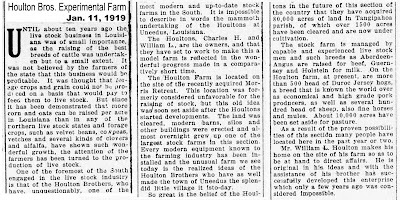 The Houlton family was big around the Madisonville area, and there was much excitement about their large farming operation starting up in the Uneedus area, just west of Folsom. Click on the article below for more information about that endeavor. From the description, it sounds like the experimental farm may have been in the vicinity of the current Global Wildlife Center. In the mid-1980's, Dr. Karl Koenig explored Abita Springs in his book detailing the history of jazz around the shores of Lake Pontchartrain. His research found many references to musicians and bands who had either frequented Abita or were from the town. The Choctaw Indians gave the name to this little village by natural springs. The Choctaw name 'Ibetab okla chit'o' means 'large settlement by the fountain.' 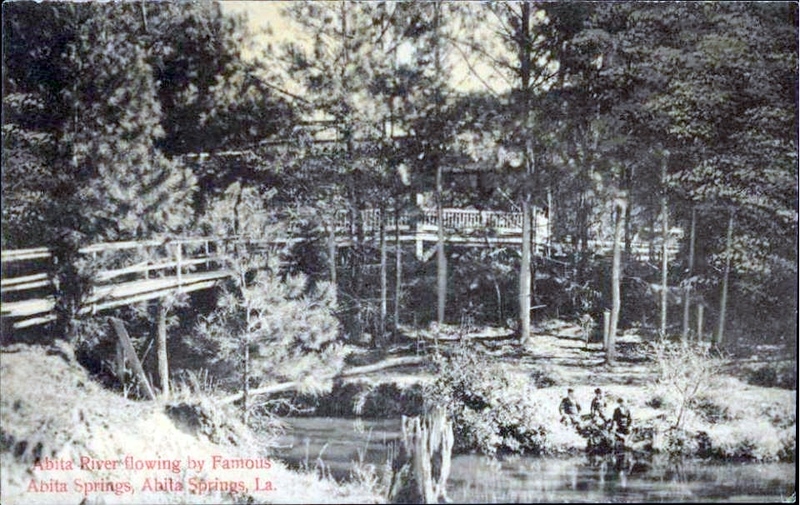 Abita Springs was officially founded as a health resort around 1853. The town was incorporated in 1912. "Unlike Mandeville, Madisonville, and Covington, Abita Springs didn't have access to the lake front, river front or the steamers on the lake. Those travelers that came to the Springs prior to 1887 came by horse and buggy. On July 2, 1887, the first train arrived in Abita Springs. A track had been laid from the pier in Mandeville to the Springs, bringing excursionists to Abita directly from New Orleans. "No longer would it take five and a half hours to make the trip. The decline of Abita as a health resort was hastened with a cure for yellow fever being found during the Spanish American War (the last outbreak of yellow fever was in 1905); the other reason being that the hydropathy itself was in decline in favor of more conventional medicine. 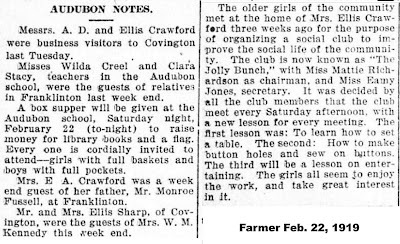 "Dances were held at the pavilion and the editor of the newspaper made a trip to observe the activity. He wrote a very interesting account of what he saw and heard. Was the band he heard a style of music from which jazz evolved? Were the three musicians as bad as he reports? Were these musicians of the type that did not read music but learned on their own, without the benefit of a music teacher?" 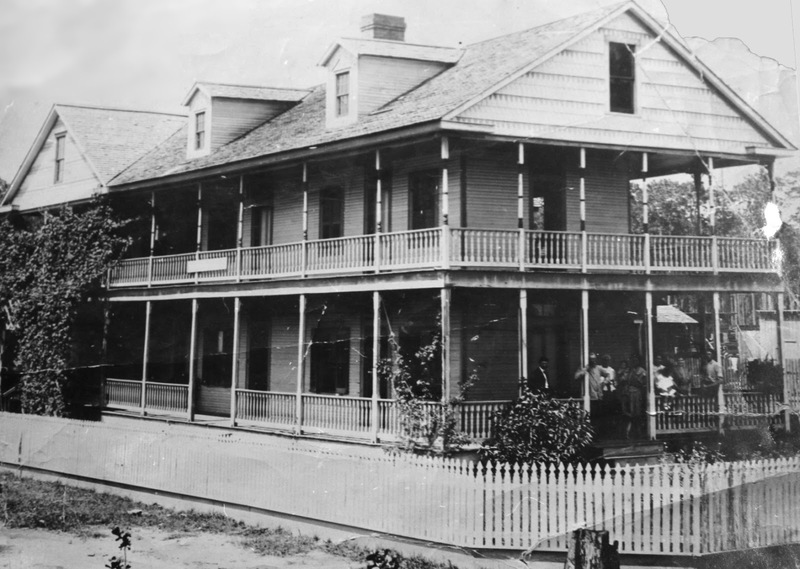 Visitors flocked into Abita in the summer of 1892 according to the newspapers of that time, as the different hotels in Abita Springs "are rapidly filling up - Bossier House, Labats, Long Branch, Morans, Martins and Summers." The Summers House still exists, and is located on Live Oak Street. 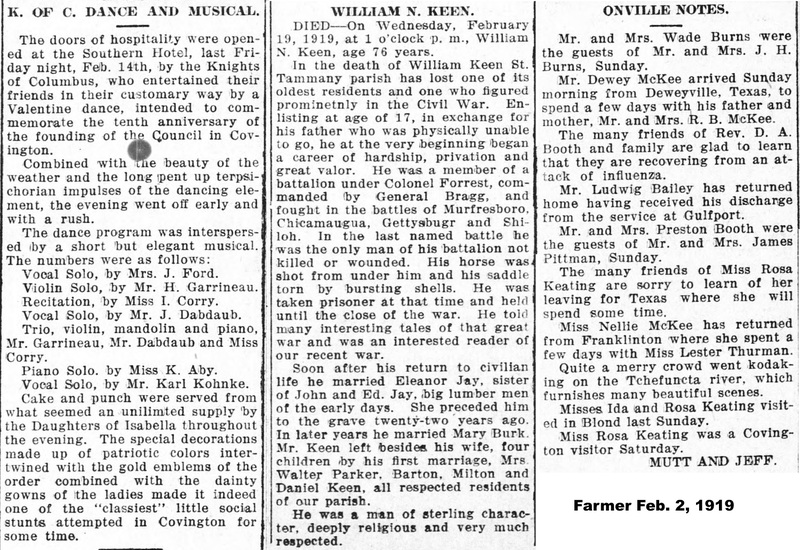 In 1893 there was not a town band and the Colomos Hotel hired the Covington Brass Band for a birthday party. 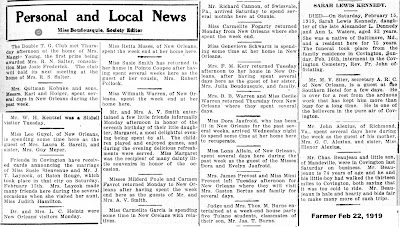 The first mention of the Abita String Band was on July 14, 1894, in the following article from the Farmer: "Reception, July 6, at Mr. W. Gunther - serenade by Abita String Band." 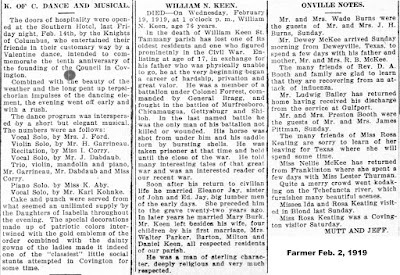 Dr. Koenig then noted that in 1914, another article about the band explained that "the local band from Abita Springs playing dances, entertainments, etc. is first called the Abita String Band, then Martin's orchestra, and finally just the Abita Band. In late 1895, the Abita band played for a party and dance at Mrs. L. Clark's House. 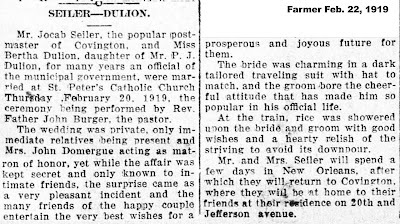 On January 2, 1897, the paper noted that the "Abita String Band treated their friends in Covington to a charming serenade Christmas Eve." On May 22, 1899, the band appeared again, this time at the Abita Dance Pavilion. "The Ragans, a family living near Abita Springs with relatives in Ponchatoula, were a very musical family. The Ponchatoula branch of the family had an organized band and played for a party on Military Road on June 6, 1902. It was a surprise party at the home of Mrs. John Eberhardt. The band was accompanied by Mr. Amedee Guyol and others on the piano." Dr. Koenig said in his book that in 1892 was the first mention of Conrad's Hall when the Abita Springs Fireman have a grand entertainment and ball there (June 21, 1902). 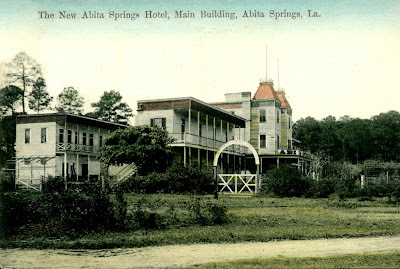 Another new hotel in town, called the Abita Springs Hotel, is opened that year, and a party travels from Covington for a dance there. Today there is only one cottage remaining, which is near Laurel and Groves Streets. 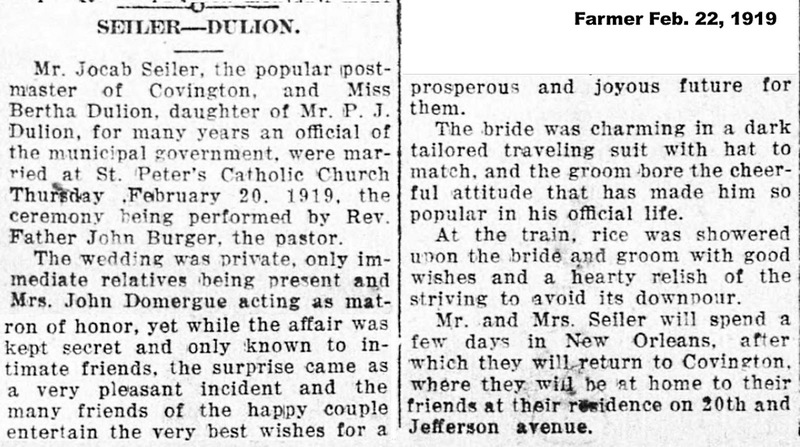 Another Farmer article states that The Ragan Brothers' Band (possibly from Ponchatoula) played a complementary ball on June 13, 1903, at the pavilion. Dr. Koenig also notes that in June of 1903 a Prof. Ricks brings a band to play for the yearly firemen's ball. "What was life like in Abita around 1888? A visitor to Abita gave the following opinion: Breakfast at 9 ...then a ramble to the springs through the pine woods. Or if one was so inclined a quiet moment in the pavilion. At 3, Dinner, then rest and leisure or perhaps a game of croquet or music in the parlor. After supper, we have a regular pitch in for a jolly good time. . .with music and entertainments. The whole concluding with a merry country dance." Dances continued in 1904 with the opening of Mutti's Hotel, according to Dr. Koenig. That hotel was located in the vicinity of Level and Warren Streets. There were frequent dances there. In another article, the paper states that Mandeville public schools have an excursion to Abita Springs and bring with them the Mandeville String Band. The band uses the bass viola player from Abita Springs. A large excursion from the Parker/Blake Drug Co. of New Orleans chose Abita for an outing in June of 1905, and this is reported, including the name of the band that has accompanied them: "Parker/Blake Drug Co. outing at Abita Springs. After the ball game the waltzing contest was called at the pavilion. Excellent music being furnished by Sporor's City Park Band," Dr. Koenig explained. Dr. Koenig's book continues: "The name of Frank Martin begins to appear as the leader of an orchestra in Abita Springs. The orchestra first appears playing for the Abita Springs ladies' entertainment and dance on September 14th, 1908. Martin was the manager of one of the hotels in Abita and was a local resident. His name appears frequently in print and his groups play for many local functions. One such appearance was for the local 4th of July celebration." Here is the news account of that event: "Abita Springs 4th of July. Martin's Abita Springs Orchestra - discoursed popular music." 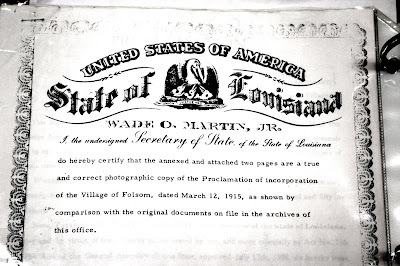 (July 11, 1908) The Martin Orchestra also plays for a dance for the Abita Social Club that met in the town hall that is today still being used. This was on July 18, 1908. Martin and Joseph Madden play for an informal dance at Bradley House on September 5th. 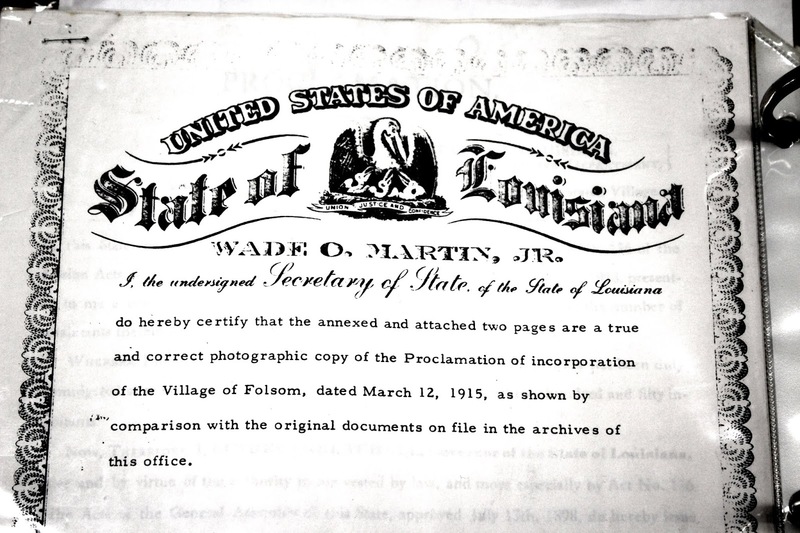 "After this entry we read the name of the Abita Springs Band but no longer find the Martin name mentioned," Dr. Koenig reported. "It is uncertain whether he moves away, or the band is no longer called by his name and becomes known as the Abita Springs Band. 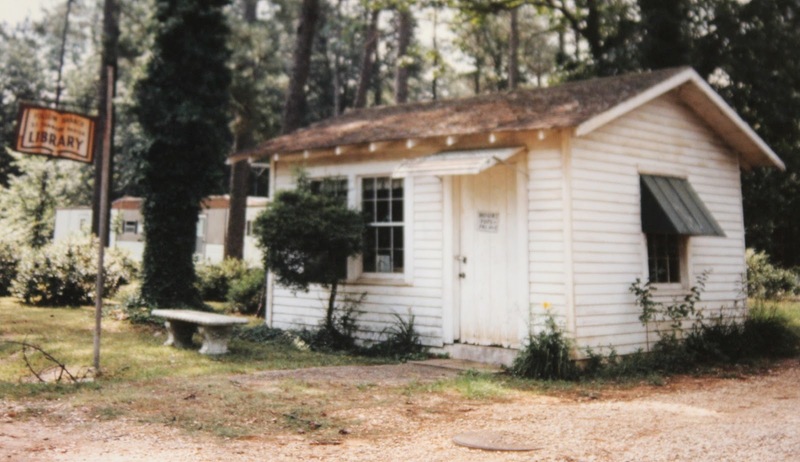 The dance pavilion at Abita is a key landmark of the history of music performances in the area, and Dr. Koenig tracks its use through a number of newspaper reports. "The center of activity and the landmark of Abita are the springs and park where the town pavilion is located. 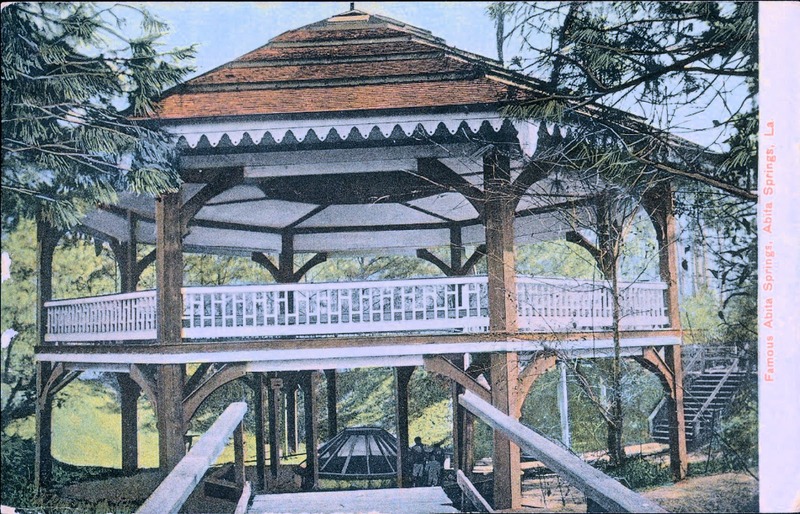 The earliest pavilion seems to have been in place in 1887, the one spoken about earliest as not being completed in time for the 4th of July celebration. "An outstanding band brought in to perform in Abita Springs in 1909 is the legendary Reliance Band of Jack 'Papa' Laine. Jack Laine's place in history is firmly set. His career is legendary in the annuals of New Orleans music history. Laine sponsored and ran a number of brass bands, each one called the Reliance Band. He led one of them and put competent musicians in charge of others. He booked them as Jack Laine's Reliance Band. The particular Reliance Band that played in Abita was under the direction of Tony Giardina. There is a follow-up story the next week on the ball: "The Reliance Band also was engaged to play a benefit for the Abita Fire Department. Usually the band received a guarantee payment, the sponsors figuring that a name orchestra would draw people in and they would make money. It was also usual that if a band made a good impression and drew a large crowd, the advertisement for an upcoming dance would mention how well the band was appreciated by a past dance crowd. 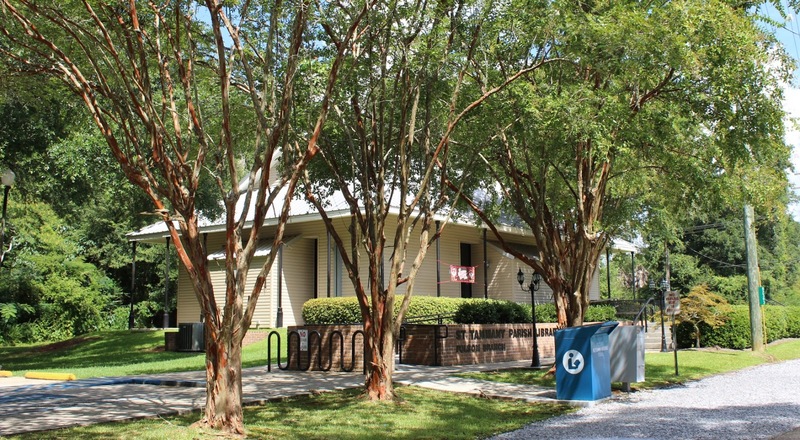 Continuing with local musical activities and celebrations, Dr. Koenig told of plans being made for a Fourth of July celebration in Abita Springs. "We read that there is a parade in the Springs and the Covington Brass Band is one of the musical participants for this activity: Abita Springs - 4th of July - About 2:00 o'clock the members of Fire Co. No. 2 headed by grand marshal J. P. Rausch and the Covington Military Band marched from their headquarters in the town hall to the pavilion...Ball in evening ended at 12:00." (July 10, 1909)"
The council and Brown reached an agreement and the band begins a long stay at the town's pavilion. Weekly ads appear in the newspaper. Brown's Band played each Wednesday and Saturday night at the pavilion along with a vaudeville show and concert. The Ragan Band played a number of engagements in Abita: June 25, August 6, July 28, 1910, January 28th and Feb. 1, 1911. For the Abita Firemen's Day parade, three bands march: the Covington Band, the Abita Field Band, and the Brookhaven Military Band (May 14, 1910). This Abita Band may have been a "pick-up band" but there were enough musicians to get together a marching band for the parade. This mention of the Abita Field Band appears only once, thereby justifying the theory of a pick-up band." 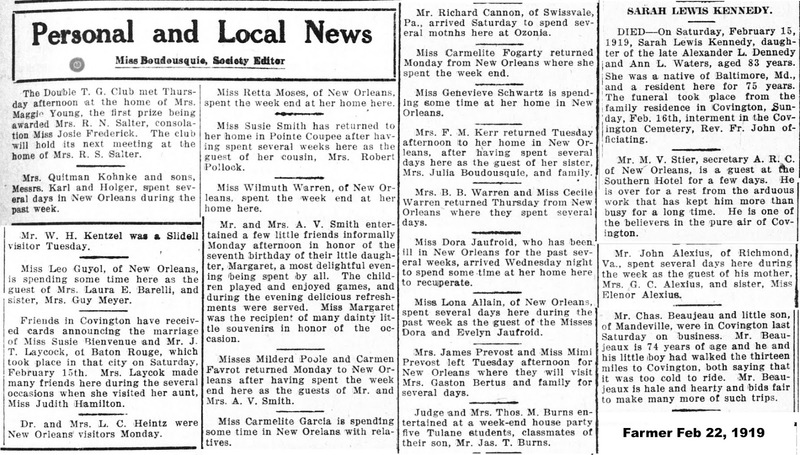 In 1912, the Brown Band still was engaged for functions in Abita. On February 3rd the band plays for a smoker at the Town Hall (part of this building is still standing - it was a two-story building with the school on top. The top floor has since been destroyed and it is now just a single story building. )On March 13, 1912, the band plays for a "grand fancy dress and masquerade ball at the town hall." The Ragan Band receives employment at the Springs for dances on February 17, and February 24, 1912. The motion picture theater was approximately where the small pavilion is now at the main intersection of Abita Springs. Though there is mention of an Abita Spring's Band in two entries-December 5th and December 12th in 1914, there are none for 1915 and 1916. These years are part of the pre World War I years. It is not until August of 1916 when there is an entry about a dance at the pavilion "with music by a good New Orleans Band." During the war years in almost every small town the activities slow down and little is said about social events. Dr. Koenig goes on to related that on April 8, 1917, the opening of the Airdome Theater in Abita that was celebrated with a big dance. It is interesting to mention that one finds, in most movie theaters of this era, the appearance of a dance floor. 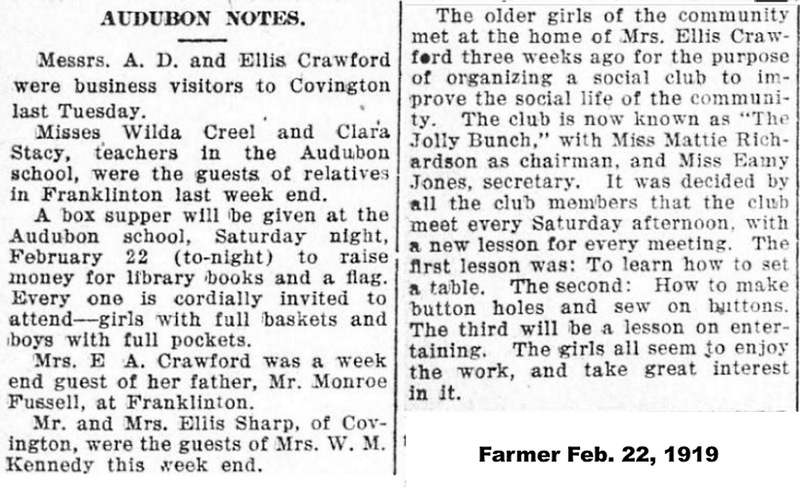 Social activity in Abita Springs is seldom mentioned in 1919. On July 5th we read of a big dance with a New Orleans Orchestra in Abita Springs. This orchestra was the Stephens Orchestra, another branch of Laine's Reliance Band. The first entry using the word "jazz" to describe a band appears in the paper on July 24, 1920. The year 1922 was a very active year on the North Shore. In Abita Springs there are weekly dances advertised in the paper, such as "Big Dance at Abita Springs - jazz music and a good time awaiting all." (April 8, 1922). 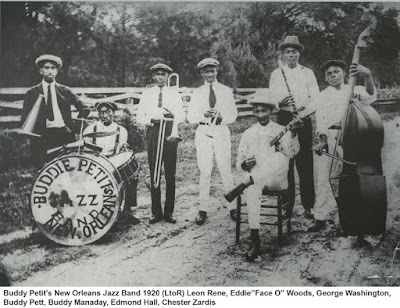 According to Dr. Koenig, Buddy Petit begins a busy summer in Abita in 1922, but it is the band from Bogalusa that receives much of the work in 1922. There is an organized brass band in Bogalusa as well as some smaller musical groups. The paper does not state which Bogalusa band it is in these early entries but does state that the Elks Band of Bogalusa plays several engagements in 1923. Mention of the "famous Bogalusa Jazz Band" in the July 1st paper might indicate the Claude Blanchard Band, which was also playing at the pavilion in Mandeville on other night of the week. This ad appears in the July 29th paper. Petit seldom called his band by any name except his own but agents have called it the "Black and Tan' Band and the "Eagle" Band. This is the first I have heard it called the "Jazz Hounds." I think that the paper just wanted to name it and thought that the name "Jazz Hounds" seemed current and apropos. "The larger Elks Brass Band of Bogalusa plays in Abita Springs on July 22, 1923, and for dancing at the pavilion on July 29th. 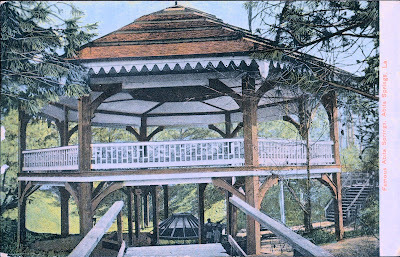 This pavilion is the Cotton Centennial Pavilion and is still standing today. This band, formally the town band of Bogalusa, when funds were unavailable from the town, was taken over by the Elks club and played for local dances in Bogalusa and at the different fairs and occasionally dances such as the ones mentioned," Dr. Koenig explained. "In 1924 Morgan's Spa is opened with a "fine dancing platform" and the Abita mayor, who also runs the famous Lyric Theater in New Orleans, brings his orchestra and his celebrated Minstrels to entertain at his inauguration celebration (July 19, 1924). When the rail cars were scrapped after World War I, the station in Abita that was the terminal of the rail route from Mandeville, was also destroyed. In its place was erected Morgan's Spa, with a large pool for swimming and a dance pavilion, both of which still exists and is on the property now owned by the descendants of the late Senator Allen Ellender. The property is on the southwest corner of Abita where Highway 59 turns sharp right into Level Street." Dances continued in Abita with other bands being engaged. "The Dixie Sunrise Orchestra" of New Orleans. (July 24, 1926), and "The Melody Jazz Orchestra" (April 16, 1927). 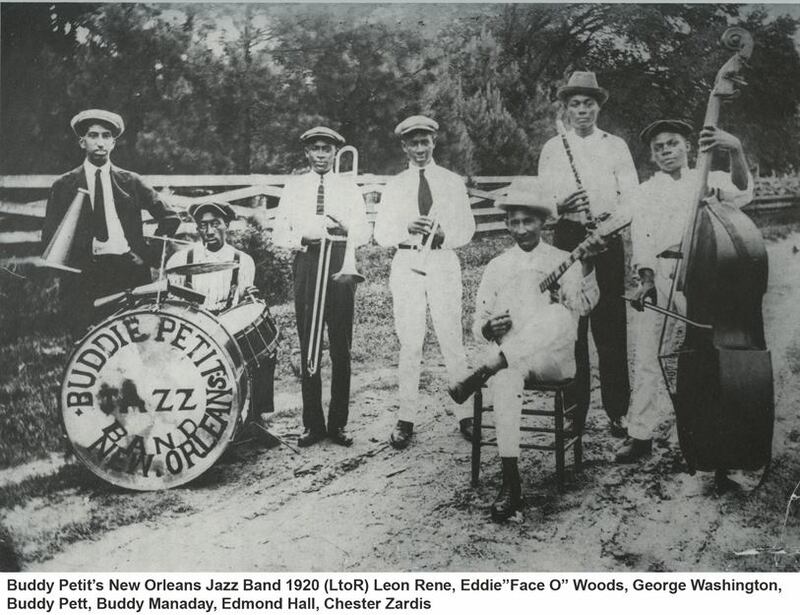 The Melody Jazz Band is playing in Abita every Sunday night during the summer of 1927. While dance continue in 1928, the only band mentioned is the "Arabian Knights Band" of New Orleans. The band plays for the 14th of July (Bastille Day) in Abita. Fast forward to the 21st century, and Abita Springs is now home to the Abita Springs Opry, a nationally-known music event with its own television program featuring roots and bluegrass music, as well as the annual "Busker" festival, which spotlights street performers who sing and play musical instruments.